Everyone needs a little "Vitamin Sea" and this Vintage Folly Beach Vacation home can give you that healthy dose of coastal comfort that you've been missing. 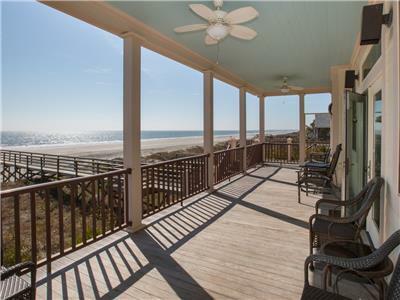 This 4 bedroom 2 bath home is a throwback to more of the classic beach cottages and sits just across the street from the sands of Folly Beach. The wood used throughout the home provides a whisper of childlike memories that have been wonderfully aged by seasons of salty air. At the front of the home is a screened-in porch and in the back is a larger deck with a sunshade and plenty of room for gathering or grilling on the gas grill. Inside you'll find that everything is classic wood. 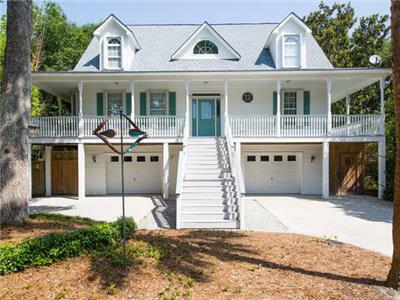 This is a beautiful example of a classic Folly Beach House. Clean white linens, comfortable bedding and our assurance of a clean and comfortable stay are awaiting you! The home is equipped with a full kitchen and living room with a small dining area set between the two. In addition to the three bedrooms mentioned above is an adorable bunk room that overlooks the back deck. The room is furnished with a bunk tucked into the corner and some closet space. This little gem completes the sailing ship illusion. The public beach access is just a few steps away from Vitamin Sea so you get to mix all the luxuries of a day on the beach with the convenience of having the Atlantic Ocean at your fingertips. Stargazing, beach combing, sun bathing, swimming and any other beach activity you may be looking forward to is right outside your door. 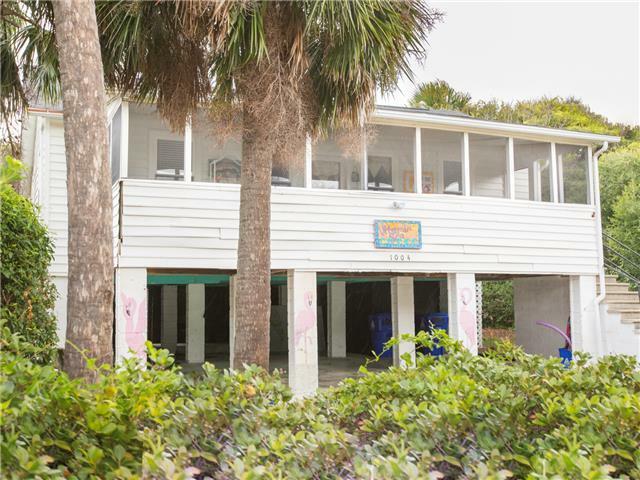 Vitamin Sea is located ten short blocks away from the crowds on Center Street so the peace and quiet of the ocean breeze rustling the fronds of the Palmetto trees while waves lap on shore is yours to savor. However, all of the shopping, dining and entertainment of Center Street is only a short drive or bike ride away. Well behaved house-broken, flea treated dogs are welcome with approval. Please include the breed and size of the pet you want to bring when you inquire. Also note that pets are not allowed in the beds or on the furniture and we highly recommend you bring a crate for them when you are not at the house, traveling and being in a strange place with strange smells and sounds can be very stressful for pets! 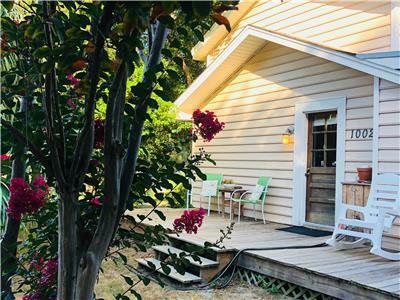 ***The owner's son occasionally stays in the cottage behind the house and will occasionally utilize the laundry facilities located below the main house. He is very quiet and respectful of common space, but we want to make sure guests are aware of his occasional presence prior to booking. The space is completely separate from the house and the yard space is separate as well. Ask him about a fishing charter or dolphin cruise, he is a licensed charter boat captain and grew up on the the water and knows the area well! *** All photos are current and accurately depict the property. PETS: This home is Pet “Friendly." Please help us keep it that way by not allowing your pets on the beds or furniture. There is a non-refundable $75 pet fee. You have to check the box for pets (it is located in the section with number of guests). The house was very clean with clean, plentiful linens. Great location, easy to find, very comfortable seating and beds, well stocked kitchen for our needs, and steps from the beach! We stayed at Vitamin Sea and it is a truly vintage cottage. My only complaint was you could not see the beach. It was convenient to walk to the beach and you could take a pet but to be that close... also underneath is kinda scary as someone could sleep there and you would never know it. To say we loved this house is an understatement! The house is beautiful with its wood floors and ceilings. Comfortable beds and cute decor! The kitchen has everything you would need for your stay, too, which was a huge help for my family and me. It has a very homey feel, and it’s very close to the beach access. The front and back porches are perfect for meals and games! We loved the natural gas grill and the outdoor shower. We will rent this house every summer! Excellent communication throughout, easy check-in and out, house clean and well equipped. Nice bed linens, bath, and beach towels. Convenient location for beach and town access.